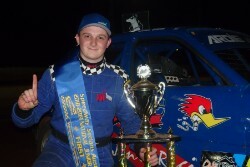 The NSW Junior Sedan Title will be held this Saturday night at the Grafton Speedway, with a small yet highly competitive field entered. National Champion Ardie Jonic heads the line-up looking to win his tenth State Title to go with his two National crowns. Kurtis Peall and Eric Wallace also from Queensland along with Zac and Hayden Brims will push Jonic all the way in the one night event.